He threw a straight right at the head of another man, catching him high up in the temple. The man’s mouth opened. Pat punched him again, this time below the ear, on the rim of the jaw. When he fell, Pat turned his attention to the next. Elliott was still struggling with the tall guy, holding him up like a man stuck inside a tent that was collapsing on top of him. Before Pat could reach out and help, two other patrons grabbed him by the arms. Grabbing people in a brawl is always a big mistake. It doesn’t stop your opponent fighting, but it does tie up your arms and effectively renders you useless. It also means that anyone that wants to hit you has a free shot. Pat drew his arms in and bent over, like a boxer. When he had the two men close beside him, he twisted and threw his right fist up towards the ceiling, catching the one on his left under the chin. It lifted him onto his toes and sent him staggering away into the crowd. Pat pulled the other man forward and drove a knee into his torso. When he hit the floor, Pat lifted a boot and stomped down on the back of his head. The tall man was still trying to hit Elliott, yelling and screaming, baring his line of grotty teeth. Elliott had the better of him, however, and had managed to prop himself under the struggling body and push him towards the door. Pat approached from the front to draw his attention. The man reached out to grab Pat, who shrugged past his hands. He grabbed the lapel of the man’s shirt and gave a sharp jerk, pulling his head forward. 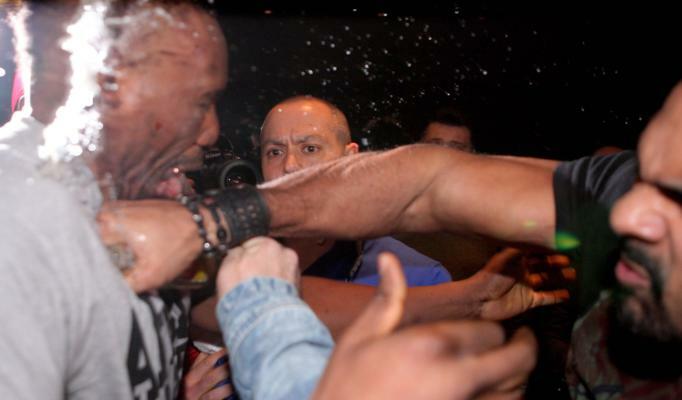 From there, he smashed four or five rapid punches onto the man’s nose. Blood erupted, dirty-black in the low light, flowing into his mouth and obscuring his teeth. At the last punch, his eyes rolled back and Pat let go. He adjusted his hold on the man’s shirt and, dragging him around like a piece of furniture, began to propel him towards the front door. The night air was a slap in the face. He was so angry he forgot to wait for the doormen to open the rope. He shoved the near-unconscious giant backwards. The giant’s legs failed to organise themselves and he fell backwards over the rope, drawing the metal stanchions down to clatter either side of him. One by one the bouncers hurled the other brawlers through the door like bags of garbage. “Can I have a drink, please?” Pat shouted across the bar, pushing his body against the timber to make a space in the crush. The shark-faced barmaid obliged him straight away, making the five-bodies-deep-swarm wait while she did so. When Pat lifted the glass, he was shaking so badly he had to strictly focus to keep some of the fluid in it. Post-mix cola; sugar and bubbles, cold as metal. Revolting, but he needed to wash the adrenaline out of his mouth. He finished the glass quickly and felt the solid chill of the fluid in his gut. He sat the empty glass on the bar and the barmaid was immediately there to take it. “Do you want a ‘drink’ drink?” she asked. “No, but thanks,” he said. Once upon a time, it would have been the only solution. The fact this was not the case gave him pause for thought. “You’ll get a job here straight away. They’ll want you after that,” she said. Pat’s nausea sharpened. He went to the front door and poked his head out. The music receded behind him. The queues either side had remained stagnant. “What’s going on?” he asked one of the doormen. The man turned around. “Nothing. Why?” Behind him, two men attempted to throw a third man’s sneakers up into the top of a power line. The shoeless man ran back and forth between them, pleading. “Should have known,” Pat said, heading back inside. Working in places like this was a kind of cyclical affair for Pat. He had felt a great deal of anxiety over the course of his life, and the booze had always done a great job of counteracting it. Without booze, the best he could do was catalyze that anxiety into aggression. The more anxious he was, the more aggressive he became, and the better at this kind of job he turned out to be. He made his way towards the back of the room. His hands continued to shake, so he put them behind his back and pressed himself against the wall like a moth trying to disguise itself against a tree. This entry was posted on October 28, 2015 at 12:44 pm and is filed under Theme Parks and Obstacle Courses. You can follow any responses to this entry through the RSS 2.0 feed. You can leave a response, or trackback from your own site.